My first post here on Redmond Pie was about the iPhone 5: An allegedly magical, amazing phone that will once again, somehow according to Apple, revolutionize the smartphone industry. In accordance with Apple’s standard release schedule, an iPhone 4S should be announced sometime next year with an all new iPhone 5 to be released in 2012. That’s not too far away, ya know. The iPhone 4 is one of the most hotly discussed gadgets on the planet today (especially with the iOS 4.1 jailbreak coming out soon), but as it stands, all the hoopla and hype that surrounds the iPhone 4 is finally going down. The dust is settling. Perfect time to discuss what we want for iPhone 5, right? Give icons extra purpose. Let the Twitter icon allow live updates of your Twitter status, let you create desktop shortcuts for calls to particular people, allow your most recent messages to pop-up on screen before entering the Mail App. We need rock hard security to protect us as we move into another phase of smartphone evolution, the beginnings of the cashless society, in which your RFID-enabled phone isn’t just a device which carries all your personal data, but also becomes the key to your bank account, car and home. While theoretically possible, such implementations can only really hit the mass market once an iPhone Walter Bishop develops a security protocol (possibly combining fingerprint, heartbeat and conventional password identification systems) that organized crime cannot break. (If such thing is possible). Dictation of email messages, memos and documents using my iPhone — why not? Further improvements in translation services. Sure, we know the iPhone 4 antenna attenuation issue is "even smaller than [Apple] originally thought", but this wasn’t all really just hype, was it? This leaves us with one small wish. Improve the antenna for iPhone 5. And work to make this a better phone, with better reception and no dropped calls. I want to hear statistics claiming zero percent call failure. That is all. I’m hoping Apple maintains FaceTime development to enable calls using the video chat software over 3G and 4G networks, rather than only via WiFi. I also hope to see the solution appear for Mac and Windows PCs alongside devices from other manufacturers. The natural evolution of the iTunes Cloud, Wireless Sync would let you update content on your iPhone without the rigamarole of finding the right cable, plugging it in and waiting around. It would free you from your Mac and enable your iPhone to sync itself whenever you happened to be hanging around at home. It may seem a minor thing to wish for, but the only cable I want to use with my iPhone is the one which plugs it into power. That’s if I couldn’t replace a spent battery with a freshly recharged one. Wireless Sync would boost usability. In an email this summer, Apple CEO Steve Jobs said that wireless sync would make it to use "someday". Which is neither a promise nor a commitment, but still makes the appearance of such a feature the tiniest little bit more probable. Symbian, Windows Phone 7, Android, webOS… they all support widgets: Those one-trick ponies that display info such as date, weather, RSS feeds, tweets directly from your home-screen, are totally absent on the iPhone and is something the platform really needs. The process of opening apps just to see the weather and read latest updates from Twitter is tedious, especially once you get accustomed to it on other other mobile OSes. The second point really explains itself and it is utterly fascinating. Imagine having a smartphone that replaces your ATM card, paper money, ID card, car / home keys. An actual smartphone. Sounds too futuristic, right? I don’t see this happening with iPhone 5 or 6, even. But it wouldn’t be wrong to say that such technology is less than a couple of decades away from becoming mainstream. Be sure to leave your thoughts on the topic in the comments section below. 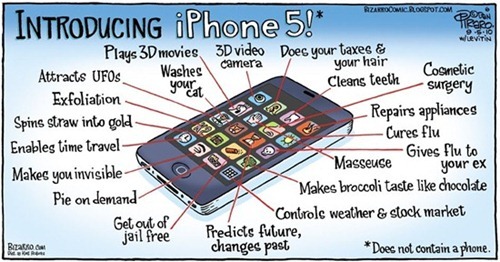 We’d love to hear what you think about the potential of iPhone 5/6 (and future smartphones, in general).